The Cooper-Hewitt has several wallpapers designed by Christine Tarkowski and produced by the Thematic Wallpaper Company which she founded in 1992. Like many of Tarkowski’s designs, this wallpaper features an everyday object, in this case a drain, to serve as its unconventional motif. Other wallpapers feature hands, meatballs, cacti, and rose thorns seemingly taken from photographs, rendered in muted colors, enlarged, and multiplied. This sidewall is unconventional in that it’s the only example in the collection to feature text. 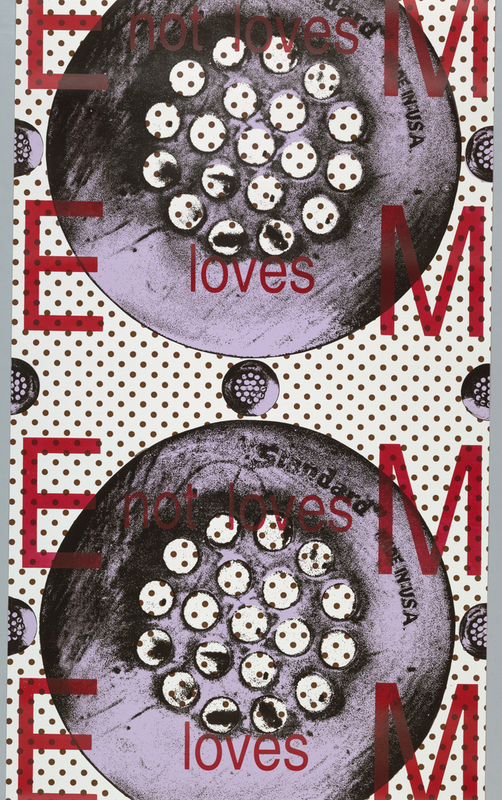 In this case the phrase “loves me loves me not” rendered in red letters is repeated over the pattern of drains. The word “me” is enlarged and split so that the letter “e” forms a column on the left of the wallpaper’s repeat and the “m” forms a column on the right. This combination of red lettering over an enlarged black-and-white photographic image is reminiscent of the work of the conceptual artist Barbara Kruger, which may be intentional, since Kruger and Tarkowski both frequently criticize consumerism in their work. Other elements, such as the polka dots and the use of a mundane, mass-produced object as a central motif, evoke Pop Art, which also criticized consumerism. Christine Tarkowski is no stranger to unconventional pattern-making. In fact, patterns and surface decoration are common features in her work. Based in Chicago, Tarkowski’s work is incredibly varied both in terms of materials used and in overall scale and size. Thematically, her work seeks to reveal the “flotsam of western culture” and frequently focuses on our often-wasteful use of natural resources. This includes pieces such as Sandbags, created in 1998 for the Socrates Sculpture Park in Long Island City, New York, which comments on our use of textiles through the creation of an enormous box-like structure covered with vinyl printed with a pattern of layered sandbags. Some of the patterns she made for the site-specific works were later adapted to her wallpapers. For instance, another paper in the collection, Aoko’s Hands, seen below, is based on a pattern she made as part of a 1994 installation for the Community Emergency Shelter Organization in Chicago. Tarkowski still works today and is a professor at the School of the Art Institute of Chicago. Kaplan, Kathy. “Off-the-Wall Wallpaper.” Chicago Tribune, Oct. 23, 1994.